Iker Casillas Fernández (Spanish pronunciation: [ˈikeɾ kaˈsiʎas feɾˈnandeθ]; born 20 May 1981) is a World-cup winning Spanish football goalkeeper who plays for the Spanish La Liga club Real Madrid and the Spanish national team, being the captain of both. In 2008 he led the Spanish national team to their first European Championship in 44 years, and in 2010, to win the World Cup, being also named the tournament's best goalkeeper. Since his early professional years as a teenager, Casillas has been recognised as one of the best goalkeepers in Europe, being nominated for the European Footballer of the Year award twice, ranking fourth overall in 2008 and continuing to be the highest-ranked goalkeeper again in 2009. At the end of 2009 he was voted into the UEFA Team of the Year for the third consecutive time. As of 2011 Casillas is one of a very select group of players who have won all major club and national championship titles. In 2010, he was awarded with the Sports Prince of Asturias Award. On 19 October 2010, Casillas became the most capped goalkeeper of all time in the UEFA Champions League and in November 2011, he became the most capped player of all time for the Spanish national team. Casillas was born on 20 May 1981 in Móstoles, Community of Madrid to José Luis Casillas, a civil servant in the Ministry of Education, and María del Carmen Fernández González, a hairdresser. Both his parents had emigrated from their home town of Navalacruz, Ávila. When Iker was a child, he lived for some years in the Basque Country, but he has always considered Madrid to be his hometown. Casillas has a brother, seven years younger, named Unai, who currently plays as a central midfielder for CD Móstoles. As a young child, one weekend Casillas forgot to post his father’s football predictions on the weekend his father had correctly predicted all 14 results. The family lost out on an estimated €1m. Casillas had started in the junior squad of Real Madrid's youth system during the 1990–91 season. On 27 November 1997 at age 16 he was first called up to the first team to face Rosenborg in Champions League, but it wasn't until the 1998–99 season that he debuted in the senior side, substituting Bodo Illgner. By the next season, he relegated Illgner to the bench and became first-choice. In 2000, he became the youngest ever goalkeeper to play in a Champions League final when Real Madrid defeated Valencia 3–0, just four days after his nineteenth birthday. Casillas lost his place in the side to backup César Sánchez after a patch of bad form during the 2001–02 campaign, but redeemed himself when Sánchez suffered an injury in the last minutes of 2002 Champions League final match. Casillas came on and pulled off several brilliant saves to deny a rampant Bayer Leverkusen the Champions League crown. Real Madrid won 2–1 and Casillas has maintained the number 1 shirt ever since. The 2007–08 season was a fruitful season for Casillas as he helped Real Madrid reclaim their 31st La Liga title and conceded only 32 goals in 36 matches to claim the Zamora Trophy. On 14 February 2008, he and then club captain Raúl González were awarded a contract for life. Casillas signed a contract extension that will keep him at the club until 2017, with an automatic extension if he plays 30 competitive matches during the final season of the contract and a buy-out clause of £113 million. His performances earned him a spot in the UEFA Team of the Year for the second time. In February 2009, Casillas equalled Paco Buyo's record of 454 matches played (for a goalkeeper) and has since surpassed it to become Real Madrid's most-capped goalkeeper of all time at only twenty-seven years old. During the 2009 summer transfer window, some Spanish media reported that Manchester City had launched a record £129 million bid for the goalkeeper. However the club denied the allegations saying that no such offer had been made. Manchester United had been rumoured to have enquired about him, but no price was announced. He had been linked with other Premier League clubs before but Casillas himself stated that he "had no intention of leaving" his boyhood club. During the 2009–10 season on 4 October in a game against Sevilla, Casillas made an extraordinary save; he ran from one side of his goal to the other and denied Diego Perotti in a one-on-one close range encounter. After the match, he received praise from fellow Spanish goalkeepers and England goalkeeper Gordon Banks, who stated "Casillas' reflexes are incredible. If he continues to play this well he will become one of the best goalkeepers in the history of the game." Europa Press reported that Casillas was the 2nd most popular Spanish sportsman on the internet throughout 2010. The study performed by company Vipnet360 examined the web presence on platforms like Facebook, Twitter and YouTube. During the 2011–12 season, Casillas won IFFHS Best Goalkeeper award, making him the only and first goalkeeper to win it 4 times. Casillas played his 600th match for Real Madrid on January 22, 2012 in a 4–1 win against Athletic Bilbao. Casillas was the captain of Spain in the 2010 FIFA World Cup finals. Casillas debuted for the national team in the U–17 level. At age 16, he was the youngest player in the Spanish squad that placed third at the 1997 FIFA U-17 World Championship in Egypt. He was later made captain of the U-17's. Two years later, he went on to win the FIFA World Youth Championship and the UEFA-CAF Meridian Cup that same year. Initially second-choice, he soon worked his way up to first-choice and eventually earned his first senior cap following some brilliant performances at club level. asillas is currently the most capped player in the history of the Spanish national team. Following his full international debut at the senior level on 3 June 2000 against Sweden (at 19 years and 14 days), Casillas was an unused substitute at Euro 2000. He was part of the roster for the 2002 World Cup, initially as the understudy to Santiago Cañizares. Coincidentally, Casillas became the first-choice goalkeeper when Cañizares had to withdraw from the tournament due to injury from a freak accident. At 21, he was one of the youngest first-choice goalkeepers in the tournament. He played an instrumental role in Spanish progression when he saved two penalties in the shoot-out during the round of 16 match against the Republic of Ireland, earning him the nickname "The Saint". One of his saves during the quarterfinals versus South Korea during the 2002 FIFA World Cup was rated by FIFA as one of the top 10 saves of all time. Casillas played in all eight Group six fixtures during Euro 2004 qualifying, conceding just four goals. He kept a clean sheet in the second leg victory of the playoff against Norway which ended 3–0 in Oslo, and started all of Spain's Euro 2004 matches. He was the first choice for the 2006 FIFA World Cup, captaining the team twice, but could not prevent La Roja from losing 3–1 to a Zidane-inspired France in the Round of 16. With the exclusion of his Real Madrid teammate Raúl from the squad for Euro 2008, Casillas was given the captain's armband. He started the first two Group D games against Russia and Sweden before being rested in place of second-choice goalkeeper Pepe Reina for Spain's group stage elimination of Greece. Casillas saved two penalties from Antonio Di Natale and Daniele De Rossi as Spain eliminated Italy in the quarterfinals with a 4–2 shootout win following a goalless draw on 22 June. Spain later went on to win the competition with a 1–0 win over Germany in the final on 29 June; Casillas kept clean sheets for the quarterfinal, semifinal, and final matches, with Sweden's first round goal by Zlatan Ibrahimović being the last one scored against him. On 29 June 2008 Casillas became the first goalkeeper-captain to lift the UEFA European Championship trophy when Spain beat Germany 1–0 in the final. In October 2008, Casillas and deputy in goal Pepe Reina broke the national record for the longest time spent without conceding a goal. The pair went unbeaten for 710 minutes, longer than Spain's longest-serving goalkeeper Andoni Zubizarreta and Paco Buyo. Wesley Sonck of Belgium ended their goalless streak when he scored against them a 2010 World Cup qualifying match. Casillas was the highest ranked goalkeeper (4th place) in the 2008 Ballon d'Or behind Cristiano Ronaldo, Lionel Messi and national teammate Fernando Torres. Also in 2008 Casillas was named the world's best goalkeeperby the IFFHS. He also came in third place in the best goalkeepers of all time ranking; beating Oliver Kahn. 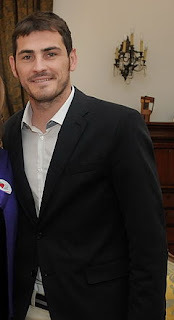 On 5 September 2009, after a 5–0 win over Belgium in a qualifying match for the World Cup, Casillas equalled Andoni Zubizarreta's national record of 56 clean sheets, and during the Spanish team's next match against Estonia on 9 September 2009, he surpassed Zubizarreta as the record holder for the most Spanish international clean sheets (this being achieved in Casillas' 98th appearance for the national team, while Zubizarreta made 126 before his retirement). Two months later, Casillas made his 100th appearance for the Spanish squad in the friendly win over Argentina, making him only the third player in history of Spanish football to ever reach this far internationally. On 11 July 2010, he captained Spain to their first ever World Cup title with a 1–0 win against the Netherlands. In doing so he became the third ever goalkeeper to captain a World Cup winning side (along with Gianpiero Combi in 1934 and Dino Zoff in 1982). He was voted the tournament's best goalkeeper and awarded the Golden Glove. In the course of the finals in South Africa he kept five clean sheets, conceded two goals, and saved a penalty in the quarter final against Paraguay. In the final, he made two crucial stops from Netherlands' Arjen Robben with the score at 0–0 after the Dutchman had passed all the defenders. On 15 November 2011, Casillas became Spain's most capped player, breaking Andoni Zubizarreta's record after starting for Spain in their 2–2 draw against Costa Rica. In January 2012 Casillas agreed a sponsorship deal with adidas to wear their Response goalkeeping gloves and Predator football boots. The move to adidas ended a long running association for Casillas with Reebok. In February 2005 Iker was the football face of Reebok's I Am What I Am global integrated advertising campaign that linked all the brand's marketing efforts under one umbrella. Since 2009, Casillas has been in a relationship with sports journalist Sara Carbonero. Avenida Iker Casillas [Iker Casillas Avenue] is a street in Móstoles, Madrid, Spain. The street was renamed from Avenida de los Deportes [Sports Avenue] on 5 January 2012 in commemoration of Iker Casillas, who was born in Móstoles. In 2011, Casillas was appointed as a Goodwill Ambassador for the United Nations Development Programme's Millennium Development Goals.